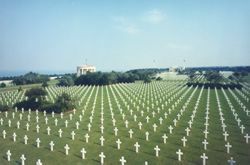 This cemetery, 172.5 acres in extent, is one of fouteen permanent American World War II cemeteries constructed on foreign soil. Free use as a permanent burial ground was granted by the government of France in perpetuity without charge or taxation. General Layout. The cemetery is rectangular in shape. Its main paths are laid out in the form of a Latin cross. Inside, beyond the Visitor's Building, filling most of the eastern end of the cemetery is a beautiful semi circular memorial with a memorial garden and Tablets of the Missing to its rear. 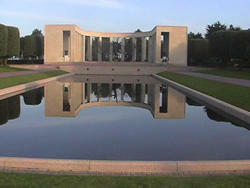 Facing West, the memorial overlooks a large reflecting pool, two flagpoles, from which the American flag flies daily, the graves areas and the chapel. The Memorial consists of a semi circular colonnade with a loggia housing battle maps at each end and a large bronze sculpture in the open are formed by its arc. The loggias and colonnade are of a limestone from the Côte d'Or region of France, the plinths and steps are of granite from Brittany. Centered in the open arc of the memorial facing toward the graves is a 22 foot bronze statue, "The Spirit of American Youth Rising from the Waves". Insert in the floor directly behind the statue are two curved garden plots. On the interior walls of the loggias are maps engraved in stone and embellished with colored enamels. These maps are entitled : "The Landings on the Normandy Beaches and the Development of the Beachhead", "Air Operations over Normandy March - August 1944", "6 June 1944 the Amphibious Assault Landings", and "Military Operations in Western Europe, 6 June 1944 - 8 May 1945". Insert in a rectangular aperture in the East and West walls of each loggia is a large bronze urn on which are sculptured two different scenes in high relief. While the scenes are the same in both loggias, their emplacement is such that the scenes facing into the loggias are different. The chapel in the graves area is constructed of Vaurion limestone. On entering the chapel, one's attention is drawn immediately to the altar of black and gold Pyrenees Grand Antique marble and the inscription : "I GIVE UNTO THE ETERNAL LIFE AND THEY SHALL NEVER PERISH", engraved across its front. Behind the altar, a tall window with a translucent amber coating illuminates is with a soft yellow light. The colorful mosaic ceiling symbolizes America blessing her sons as they depart by sea and air to fight for freedom, and a grateful France bestowing a laurel wreath upon American Dead who gave their lives to liberate Europe's oppressed peoples. The Garden of the Missing is located behind the memorial structure. Its semi circular wall, contains the names ans particulars engraved on stone tables of the 1,557 Missing in the region who gave their lives in the service of their country but whose remains have not been recovered or positively identified. An asterisk identified those subsequently recovered or identified. Included among these are twin brothers. They came from 49 of the 50 States of the Union, the District of Columbia and Guam. The tablets are separated on the wall by large sculptured laurel leaves. The graves area contains ten grave plots, five on each side of the main mall. Interred within them are the remains of 9,387servicemen and women. Three hundred and seven of which are Unknowns ( whose remain could not be identified ), three Medal of Honor recipients, and four women. A Star of David marks the grave of those of the Jewish faith, a Latin cross all others. The precisely aligned headstones against the immaculately maintained emerald green lawn convey an unforgettable feeling of peace and serenity. The plantings. The cemetery is surrounded on the East, South and West by heavy masses of Austrian pine, interplanted with Laurel, Cypress and Holly oak. The lawn areas of the Garden of the Missing are bordered with beds of polyantha roses, while Elm trees grow in the lawn areas. The architects for the cemetery's memorial features were Harbeson, Hough, Livingston & Larson of Philadelphia, Pennsylvania. The bronze urns as well as the bronze statue are the work of Donald De Lue of Leonardo, New Jersey. The landscape architect was Markley Stevenson, also of Philadelphia. The dedication ceremony was held on 18 July 1956.